Caffeine speeds us up, Ambien slows us down. Fast or slow, in America race is always there, much as we still spend huge amounts of energy denying it, trying not to face it. Is Starbucks’ closing of 8000 stores “facing it”? Yes, in a way, but Roseanne Barr’s follow-up tweet blaming Ambien for the racist tweet she aimed at “vj” shows how deep racism goes. Sanofi Aventis, the company that makes zolpidem tartrate (Ambien), quipped that its drug had several side effects, but racism wasn’t one of them. There are formidable social, cultural, and economic structures in place to keep racism going strong for decades to come, but Barr’s “excuse” shows that all these together might not equal the strength of those implicit, Ambien-deep biases that might keep it going for much longer than that. Will we ever get deep enough? Will attacking systemic racism finally end up changing our deep national and personal psyches, even our spirits, without too much real soul searching? Starting there is better than nothing, but it may not be deep enough. Implicit bias training—all these things driven by good will—might not be either. 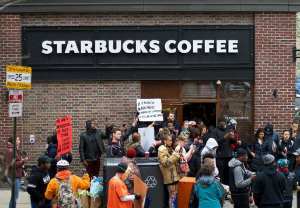 It’s ironic that Starbucks, of all companies, should have been the site of one—there are so many!—of our more recent, prominent racial incidents. This was the company that not too long ago launched an ill-fated “Race Together” initiative aimed at getting people to talk about race. But it’s also a company whose very presence in a neighborhood often signals the gentrification of that neighborhood, a process that often pushes blacks, other minorities, and poorer people away. In this complex light, one of Barr’s latest tweets notches up the irony (or white self-pity). You’re tired of being smeared? Oh, really. This entry was posted in Diversity & Multiculturalism, Reviews & Commentary and tagged James Baldwin, Roseanne's Ambien tweeting, Starbucks closes stores for bias training. Bookmark the permalink.